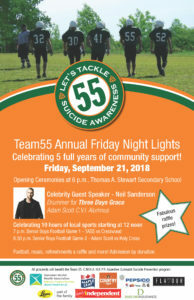 On September 21, all of Peterborough and beyond is invited to Thomas A. Stewart Secondary School for the annual Friday Night Lights, a Team 55 event supporting suicide prevention through the Canadian Mental Health Association, Haliburton, Kawartha, Pine Ridge. While the event has drawn big crowds in the past, organizers hope this year will be even bigger as they embrace the opportunity to showcase the community’s passion for suicide awareness and mental health to the Parliamentary Assistant to Ontario’s Minister of Health who is expected to be in attendance. “We really need to get as many people to TASSS on Friday night as possible. We want to pack the place,” says Dave Pogue, founder of Team 55, Let’s Tackle Suicide Awareness. Funds raised through Friday Night Lights (F.N.L.) this year will once again go towards C.M.H.A. H.K.P.R. ‘s Assertive Outreach Suicide Prevention (A.O.S.P.) program. With the Parliamentary Assistant in the audience, this is not only our chance to show the Province first-hand the benefit of this program in hopes of receiving government funding to support these life-changing results but also to highlight the immense support this community has given to the A.O.S.P. program. Approximately 4,000 Canadians die by suicide each year. Anyone can be at risk regardless of age, gender, socio-economic status or race. Launched in June of 2016, the A.O.S.P. program provides follow-up to individuals (and families of those) who have made a serious suicide attempt with the intent to die. The program has served more than 100 individuals and families. Through the great work of A.O.S.P. staff, none of these individuals has made a further attempt at suicide. “At our annual F.N.L. events, we’ve seen as many as 2000 people before. This year, we want to beat that. We want to show the Province how much we support this program so they’ll support it,” says Pogue. In addition to seeing some of the best high school football in the province, attendees can again participate in a fabulous raffle offering unique prizes and witness our engaging opening ceremonies with this year’s special guest speaker Neil Sanderson of Three Days Grace. The Canadian band, including the Adam Scott alumnus, is about to embark on a European tour before returning for a Canadian tour in late November. “The opening ceremonies are your chance to hear from our guest speaker and listen to impactful stories that will inspire you to support mental health in any way you can,” says Pogue. A barbecue will also be running from 12 noon when games start and through the end of the event. Team 55 t-shirts and souvenirs will be for sale and everyone there can have the chance to chat with a representative from C.M.H.A. H.K.P.R. about the agency as well as the A.O.S.P. program in particular. We hope this will inspire donations. While C.M.H.A. H.K.P.R. has submitted two proposals for funding for the A.O.S.P. program under the previous provincial government, neither have been approved. It is because of the generosity of the Peterborough and Kawartha Lakes communities that the programs in Peterborough Regional Health Centre and Ross Memorial Hospital are able to continue. “We are so grateful for the support of Team 55 as well as all donors who make this program possible. 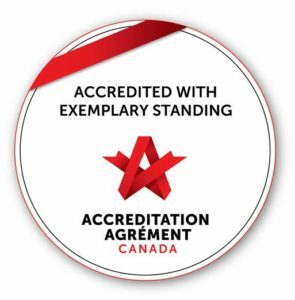 Their dedication to mental health and suicide awareness has had an incredible impact on the lives of so many in our community,” says Jack Veitch, Manager of Community Engagement and Education for C.M.H.A. 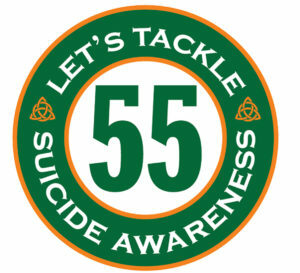 H.K.P.R..
For more information about Team 55, Let’s Tackle Suicide Awareness, visit their Facebook Page at https://www.facebook.com/team55tacklessuicide/. To learn more about C.M.H.A. H.K.P.R. and its programs, visit www.cmhahkpr.ca.